Designed with space saving in mind, the Cuisinart® Small Spaces BBQ brings together the exceptional cooking results of the renowned Ceramic Heat Technology™ Cook system, in a sleek, gourmet chef inspired and tested bbq, with thoughtful folding side shelves and a fully functional storage cart. 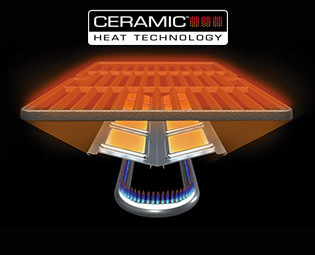 Ceramic Heat Technology™: A hybrid radiant system that combines all of the benefits of ceramic stones, with that of a durable and effective, stainless steel radiant that delivers the most effective radiant heat, even and consistent cooking temperatures, of any BBQ in its class. 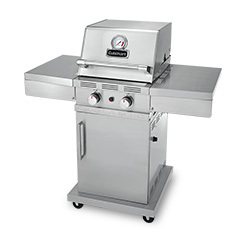 Versatile Double Burner Cooking System: Two stainless steel double burners offer superior burner to grill surface coverage, resulting in even, consistent heat, reduced cold spots and fewer flare ups. Space Saving: Featuring folding side shelves and a compact design, this barbecue is ideal for smaller yards, and patios.